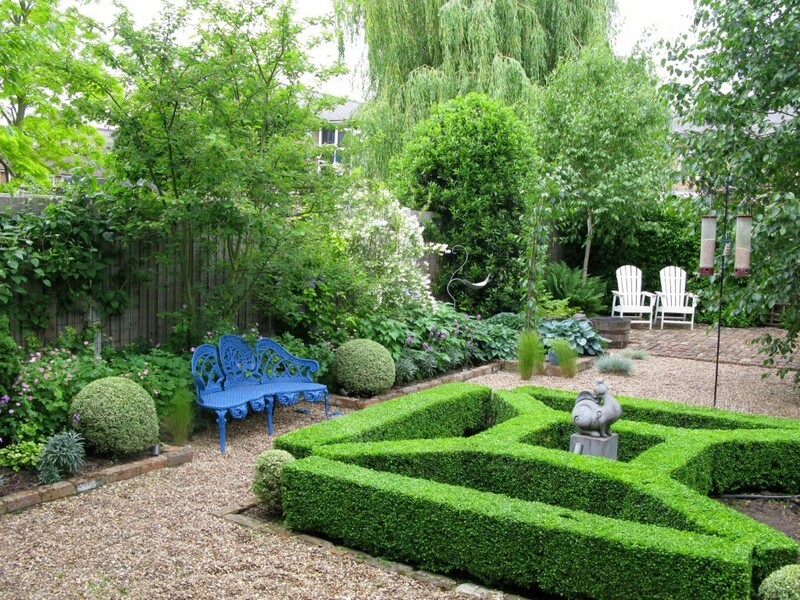 Classic garden design for Victorian house, with strong structured evergreens, for keen gardeners. Following a full renovation of this Victorian house in Wimbledon, we worked upon the already good structure our client had created. 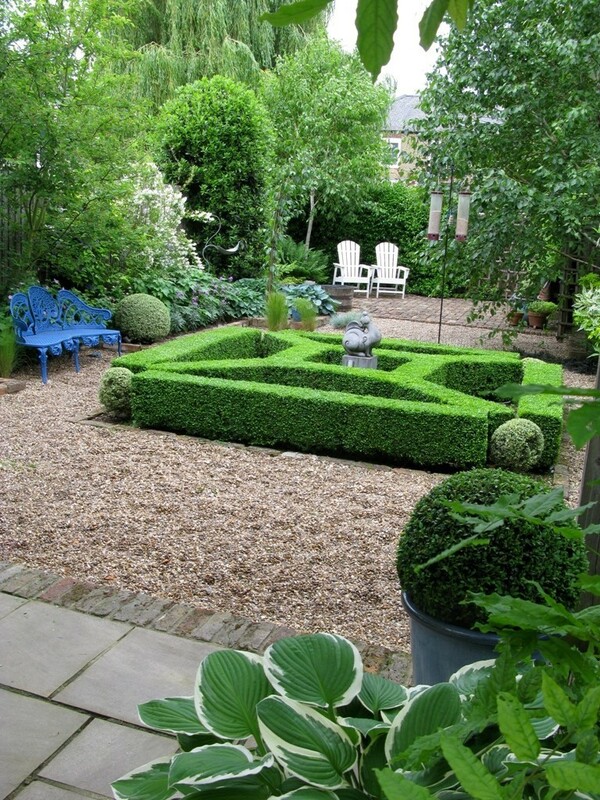 Our client (who was extremely knowledgeable about plants) was keen to contrast formal aspects of the garden with some more traditional elements to achieve a beautiful and relaxing place to be, with plenty of interest, and no grass! As with most London gardens, creating a haven of privacy away from neighbours was important, as was a garden that changed with the seasons and provided a stunning outlook from the house all year round. 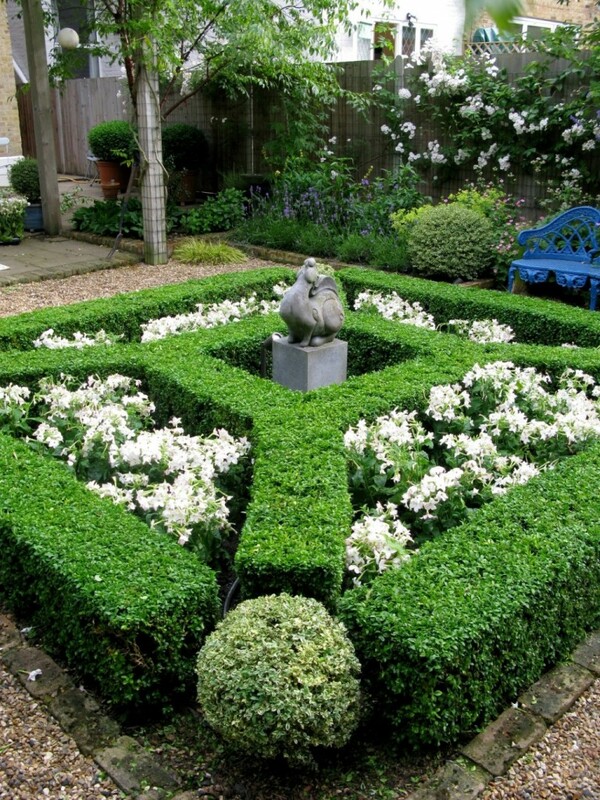 Using the existing parterre as the central feature we installed multi-stem Betula utilis jacquemontii ‘Doorenbos’ with pure white bark, along with a mix of topiary shapes. 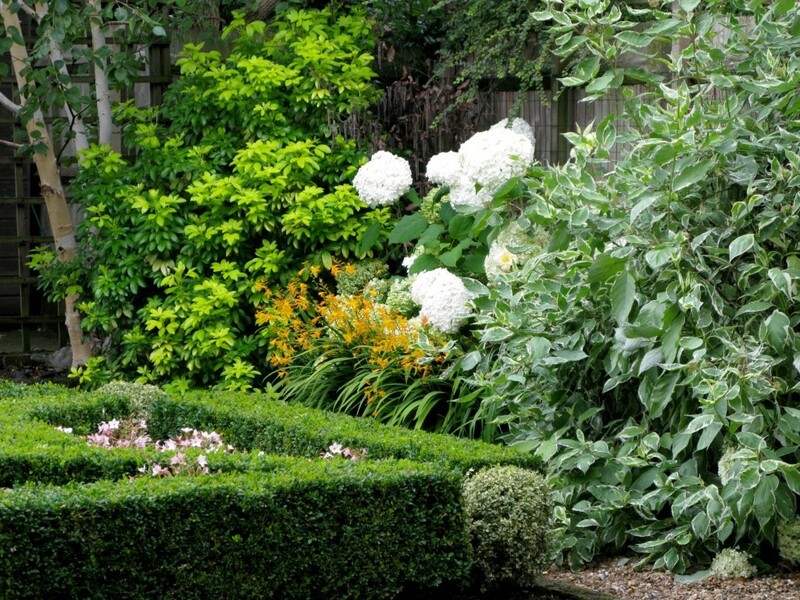 To contrast with the strong evergreen framework we opted for loose informal planting, using a colour pallet of lilac, white and pale pink contrasting with the odd shot of bright orange. With the advantage of a south-facing aspect and excellent soil, we added a good mix of shrubs that flowered throughout the year at different times such as Choysia, variegated Cornus, and Amelanchier lamarckii. 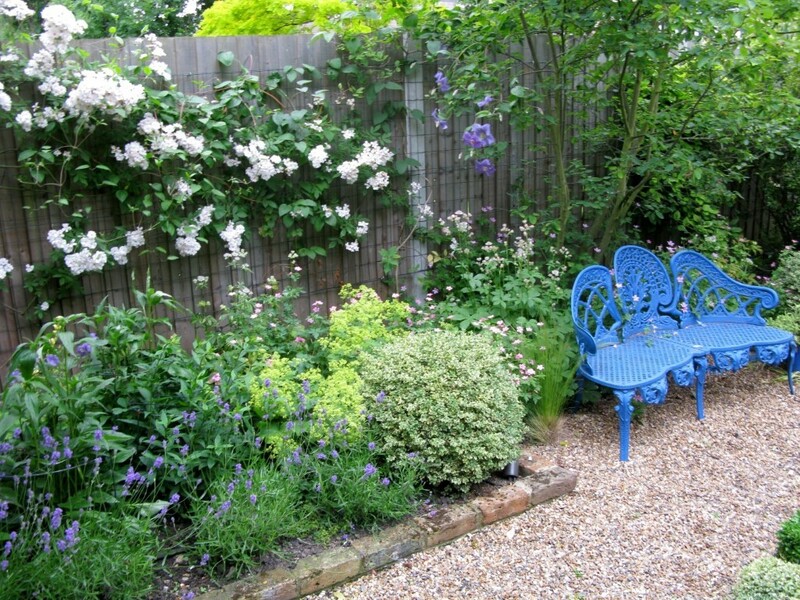 We used Hydrangeas mixed with hardy Geraniums, and Lavender, Anemones and Hostas. 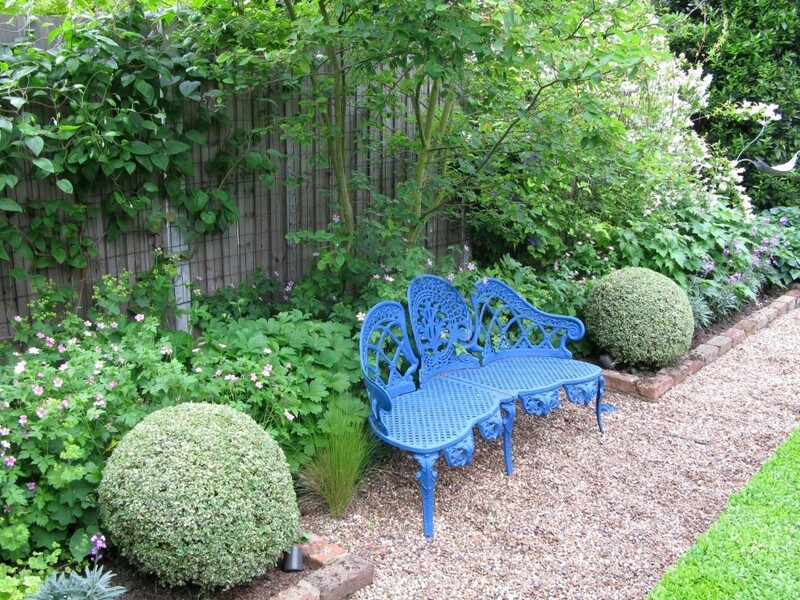 Bright colour accents came from Clematis and Crocosmia in the planting, and the vivid indigo ceramic planters and benches placed around the garden. Over the years, we changed the planting in the sections of the parterre: one year purple Alliums, another with white Cosmos. 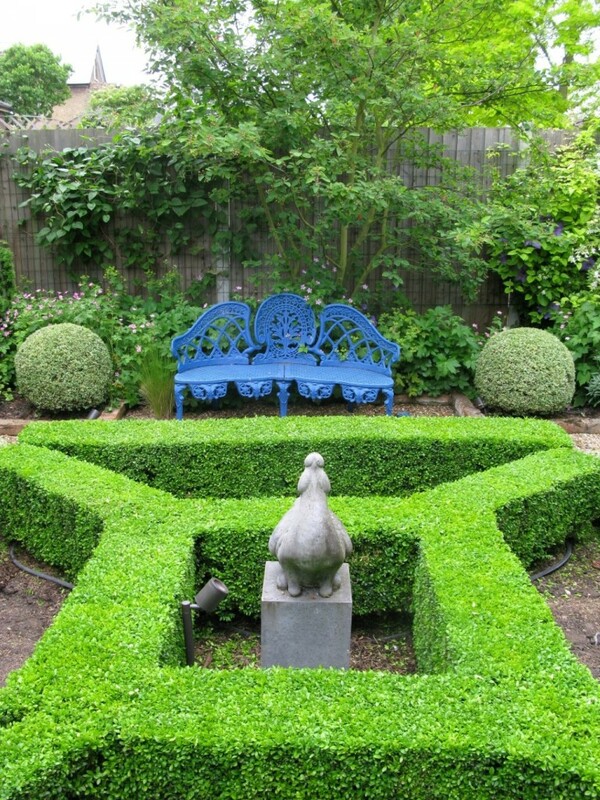 It takes time to establish a formal garden and planting plan such as this but the wait was definitely worth it, and our client now enjoys a beautiful and changing vista from the house throughout the year.